When San Antonio Dermatologist Dr. Annabelle Garcia, mentioned that I would be a great candidate for CoolSculpting, a popular FDA-approved procedure to rid the body of stubborn fat, I wasn’t sure whether to be excited or a little offended. The former journalist in me was intrigued by the idea that fat can be frozen away in a non-invasive procedure. The 43-year-old mom of twins plus one in me’s thoughts went right to my abs. You know, imagining what it would be like to find them again and all. 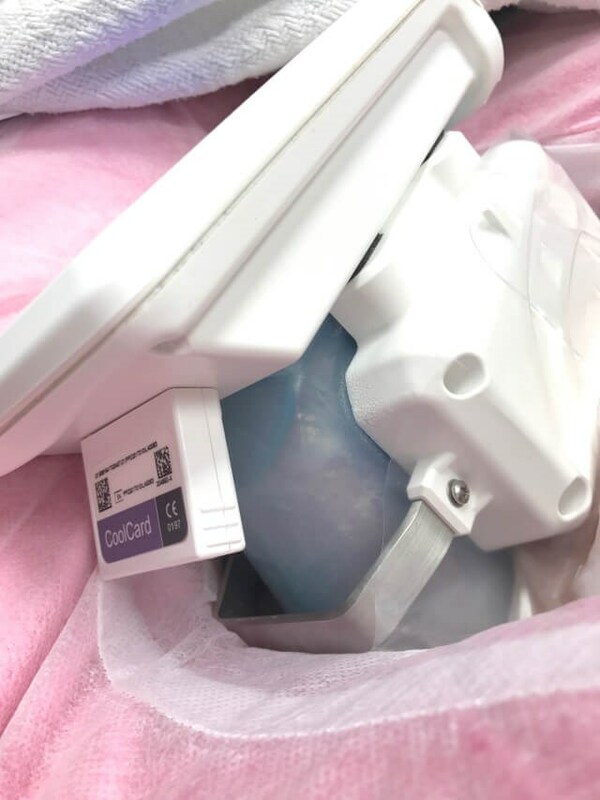 So it is was with some thrill and great curiosity that I agreed to undergo a complimentary CoolSculpting gig in exchange for sharing my experience – The good, bad, and at times, ugly. The news, as it was told to me, is that I have enough fat to freeze. Maybe it was the comfortable surroundings at Sonterra Dermatology or how just the right amount of natural light seemed to pour through the 2nd story office window at my CoolSculpting consultation, but I somehow didn’t mind when Daniella, Dr. Annabelle Garcia’s kind and compassionate PA, grabbed a hold of my belly with a good solid pinch. The test was simple and I passed with flying colors. I had “pinch-able” fat in my lower abdomen area. Yay me. I have “pinch-able” fat according to Dr. Garcia and the Sonterra Dermatology team. Yay me. 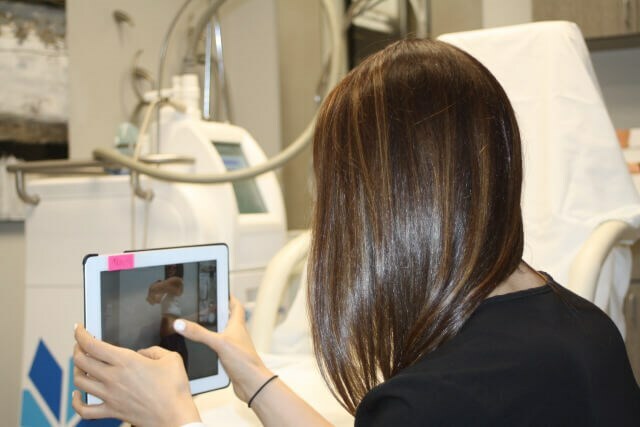 When you are about to undergo CoolSculpting or any cosmetic procedure for that matter, it is, of course, important to understand exactly what it is that you’re having done. Having watched several CoolSculpting procedures first hand as Dr. Garcia’s PR manager, I was comfortably familiar with the CoolSculpting process and interestingly, how it got its start. CoolSculpting came about around 2011, after pediatric doctors discovered that toddlers sucking on popsicles while teething suffered fat loss. Apparently, the infants would come into the clinic with little indents in the fat of their cheeks. A team of scientists and doctors went to work studying the atrophy effects of freezing fat and the beginnings of what is now CoolSculpting was born. I have been fortunate enough to have seen my share of CoolSculpting before and after photos and the often dramatic results. It has been eye-opening to hear women say that they knew they had good lines hidden somewhere in their stomach area and that CoolSculpting helped them find them again. It has been nothing short of amazing to hear a mom of two say that CoolSculpting was the kick she needed to jump-start a fitness routine that she has finally stuck to. While these testimonies are incredible, Dr. Garcia and Daniella reminded me, however, of the importance of having realistic expectations with my CoolSculpting results. They reiterated: I could expect to see a 25-percent reduction in the treated area. And therefore, it is wise to have a good idea of what that really might look like beforehand. 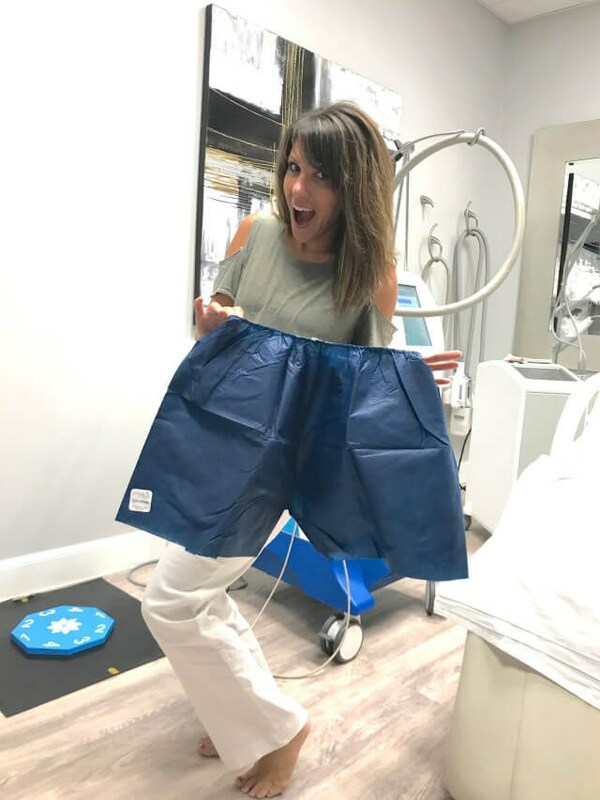 So, Daniella thoughtfully showed me photographs from a beautiful mix of of shapes and sizes – real CoolSculpting patients and their 25-percent. That really helped me envision what a 25-percent reduction in fat could look like on me. Also, Dr. Garcia reminded me that CoolSculpting is meant to help someone with what’s referred to as “stubborn” fat. I had never thought of my fat as stubborn before. Bothersome? Yes. Discouraging? Yes. But stubborn? That’s what I called my twin sons when they refused to wear long pants on the coldest of winter days despite my pleas and warnings. Stubborn fat is a lot like that. Despite efforts to get rid of it, stubborn fat just won’t seem to go away. That is the kind of fat CoolSculpting targets. CoolSculpting isn’t meant to be a major fat loss solution. In fact, it is recommended that CoolSculpting candidates are about 10 to 15 pounds from their goal weight before having the treatment. Of all the reported benefits of CoolSculpting, however, what I have found most attractive about it is that CoolSculpting is permanent. That fat we freeze? Gone forever, say CoolSculpting experts. Your body metabolizes the targeted fat naturally over a three to four month period. So, for roughly 12-hundred dollars per area, you can kiss a healthy portion of your fat goodbye for good. Like with most cosmetic procedures, I was expected to get those infamous “before” pics so I can one day soon be photographed with my so-called after shots and then compare the two. So, Daniella handed me a pretty snazzy pair of shorts to wear during the procedure. Shorts on and shirt lifted, I tried to stand pretty for my ‘before’ photographs. That’s not so easy to do when you’re standing with your feet hip-width apart on a small, blue dial of sorts, slowly turning, so that every angle of your so-called problem area can be photographed. Next, Daniella used a highlighter to mark the exact points where I’d be getting the CoolSculpting. I liked the fact that Daniella was precise and intent on getting the CoolSculpting applicator placement just right. This was not the type of treatment on which I wanted someone to simply guess. “Applicator”, by the way, is a CoolSculpting term good to be familiar with before going under the cold. CoolSculpting typically targets one area of fat at a time with either one or two applications. My consultation determined that I would probably see better results with two applications. That meant I would have the CoolSculpting machine placed at two different places, symmetrically, on my lower ab area in the shape of a “V” of sorts. With my lower abdomen area clearly marked for the two applicators it was about to meet, I was almost ready. As I reclined to a comfortable position in the procedure chair, Daniella gave me a blanket (because CoolSculpting, duh) and placed a pillow on my abdomen. Then, Daniella turned on a large flatscreen TV and turned on Netflix. I had to pause for a brief and super pleasant reality check. I was sitting here being waited on. I had a stack of the most current Us and Peoplemagazines at my side. And I was about to watch Netflix without a kid, two, or three jockeying for my attention. Not only did I now not fear this CoolSculpting process that was about to go down, I began to relish the idea of two hours of pure uninterrupted “me” time. I was about to Netflix and chill. Literally. To begin the CoolSculpting treatment, Daniella placed a very cold protective strip over my lower abdomen. She warned me that it might take my breath away for a second, which it did. It reminded me of that fleeting shock felt when jumping into a cold pool. Within seconds, my tummy was used to the feeling. Look closely and you can see the skin of my lower abdomen, the area being treated with CoolSculpting, following the so-called “grab”. Next, was the CoolSculpting “grab”. I was able to snap a very cool picture of this. Daniella told me that it is important, when undergoing CoolSculpting, that the machine get a real good hold of that “pinch-able” area it’s about to treat. So, on a count of three, Daniella placed the machine precisely over the area that she had highlighted a few minutes before. I felt a good tug. Because I’m vocal, I think I may have uttered a quick “ooh” sound while breathing through the grab. Daniella looked at the machine. She looked at me and then smiled with satisfaction. “You got a really good grab,” she said. Once connected to the CoolSculpting machine, it was time for the big work to begin. The CoolSculpting machine went to work on my lower tummy while I just sat there enjoying my Netflix. So far, CoolSculpting was just as others had described to me – slightly uncomfortable and relatively painless. It felt cool, not cold as the machine consistently tugged at my target area. In fact, the least desirable thing about the CoolSculpting treatment is what I saw with my own two eyes after the CoolSculpting machine finished its hour of freezing. When the freezing process had finished, Daniella removed the CoolSculpting machine from that area of my lower abdomen. I had almost wished she hadn’t taken me off the machine. My belly was unrecognizable to me. And you may want to as well. Soft, red, and protruding, my abdomen moments after CoolSculpting looked like a stick of butter wedged beneath the skin. It was tender to the touch. I found my belly even more uncomfortable to look at as Daniella massaged the swollen treatment area. Doing so, Daniella said, has shown to dramatically improve results. It actually reminded me of my belly in the days following giving birth – ten years ago. No baby now. Just stubborn fat. Though not pretty at times, when it was all said and done, within two hours of having stepped through the Sonterra Dermatology doors, my CoolSculpting treatment was complete. I was free to go and wait eagerly for my CoolSculpting results. I would be remiss if I didn’t mention that the days following my CoolSculpting brought all the feels in a very “I just recovered from a procedure” kind of way. Though the procedure was non-invasive, simple, and relatively painless, I soon realized that not unlike most treatments, when the body is put through trauma, or something it isn’t accustomed to, it might react. On days one through three post-CoolSculpting, my belly was sore and swollen. I walked extra carefully as not to rub up against anything, and, I definitely didn’t want to sleep on my stomach. I could go about my work day as normal, however, I was happy those first few days that I work from home and the weekend was near. I only wanted to wear yoga pants or loose-fitting athletic shorts. I did not feel up to exercising or doing any major housework. But then, that’s not really out of the norm. Days four through six brought some itching around my treated area and nerve pain. Apparently, my nerves had to reawaken in a sense, which because they’re nerves, doesn’t feel great. Some people have described this nerve pain as comparable to being stung by bees. Honestly, I felt more like my lower abdomen was being pricked by tiny needles. Though I knew what I was experiencing was normal, I called Dr. Garcia, just to be safe. Showing the compassion and concern she’s praised for, Dr. Garcia immediately calmed my fears and she prescribed a medication for nerve pain. I took the medicine as prescribed and it was magical. By day nine, any nerve discomfort had completely disappeared even without the medication. Additionally, the swelling was now minimal and the itching had subsided. At this point, I was feeling good and looking forward to my results! Like the popular saying, The best things in life are worth waiting for, such are my CoolSculpting results. In today’s world of instant everything, CoolSculpting requires a little patience- three months worth. Though I think I’m beginning see more of my pre-kids abs already just one month after CoolSculpting, the results won’t really be noticeable, says Dr. Garcia, until three or four months post-procedure. That means I should be able to buy a killer holiday dress, this December. So hang tight. And pray my abs do too. And I’ll again entertain you with way too many shots of my belly again, coming soon. In the meantime, if you have questions for Dr. Garcia or me about CoolSculpting, please post away in the comments below.